Being healthy is having body functioning as it should be naturally. Get Hungry, Eat Drink Water, Rest, Work Hard Physically and Mentally, Get Tired, Sleep, Wake Up, Clear and Clean your body and mind, Get Hungry and so on. This is the natural cycle which if followed will give you long healthy life. For this we should use wisdom of Ayurveda as this system is focused on keeping healthy and preventing diseases (dis-ease – feeling not easy). If you get ill damage is done and it is very difficult to fully recover not to mention the problems it brings. It is far easy and cost-effective to not fall ill in first place. For this follow the ideal Ayurvedic daily routine. Vatta (Air element) – Moving of air Prana Vayu (Life Force) in body. Pitta (Fire element) – Digesting food, giving energy. Kaffa (Water element) – All the fluids in body. When all Doshas are equally flowing in body, body is healthy and when any Dosha is affected we get ill.
Let us see remedies prescribed by Aurveda for them one by one. To avoid majority of Physical Disease follow this routine. 1. A man with good character and nature has very less mental worries and lives life fully, so he has less diseases. SLEEP AT RIGHT TIME. Then get up early. Ideal time to go to bed is 10 p.m. A sleep of 8 hours from 10 p.m. to 6 a.m. is best. 10 p.m. – 6 a.m.(9 p.m.-5a.m. is also good) is Vatta time which is for sleep and rest naturally. 6 a.m. – 2 p.m. is Kaffa time which is NOT for sleeping. Sleeping in this period will definitely give you Headache (remember how after disrupted sleep your headache starts disappearing after 2 p.m.), 2 p.m. – 10 p.m. is Pitta time at which time body is most active. You can take a nap of 15-25 min at afternoon (between 2 p.m. to 5 p.m.) if you are really tired otherwise do your work and get tired. You need 8 hours of sleep at all costs (minus the time you nap at afternoon, meaning 7 and 1/2). You may have heard many people just sleep for 4 hours, well they are degrading their health. You will not be able to sleep more than 6-7 hours generally if you are inactive. So you must be active and hard working. Doing things with more speed because of better health, mind, wisdom and planning will get you far more in your life then burning midnight oil. Lack of sleep makes you less intelligent and more tired. Consequently you cannot do your top quality work. And one can improve his life mainly through quality work (working in right direction). Drink water. Empty your bowels (if you eat right, sleep at right time and get up early this is not a problem). Work hard in day so that Perspiration cleanses your body through skin. Do not forcibly stop call of nature. Brush your teeth, never drink bed tea. Cleaning body of impurities is of utmost importance in remaining healthy. As anything stopped in your body will make you sick, and energy of body will go in taking that waste product out through sickness. Avoid Cooler and Air Conditioner especially as much as possible. Air Conditioners trap sweat inside the body and increase cough, both of which are very harmful.Waste products should flow out of body and energy should enter the body. First do heavy exercise, then take rest, then do Yoga, take rest, do Pranayam (see Yoga book for this), then do Tratak (see Yoga book) (optional), then Meditate. Teeth Care – Brush teeth twice daily. Brush in front of mirror so that you can brush difficult areas and do not forget to brush back of teeth. Use toothbrush gently so as to not harm the gums. Change toothbrush every six months. Avoid sweet foods. If you must eat sweets eat once only. As after eating sweet foods ph factor of mouth remains affected for 1/2 hour before becoming acidic again. It is venerable to bacteria during this period. So eating sweet all day round can damage your teeth soon. do not eat sweets 2 hrs before sleeping. Check with your dentist every six months. Clean your teeth for tartar at least once in 2 years or when your dentist says so. is the best Yoga book I have read covering all topics. 20 Crunches, 20 Push Ups, 20 Situps, 2 Jumps, 5 min running is enough for most people. Will not take more than 15-20 mins and if you cannot give that much time for health than you cannot remain healthy. Proper breathing is very important in Yogasanas. Suryanamsakara, Pashchimottanasana and Konasana, Chakrasana and Hastpadottanasan, Sarvangasana, Shavasana is a very good set of Asanas in this order. Shavasana should be done on floor or on hard surface. As you can see in the figure below, while doing Shavasana important acupressure points of body are put under pressure when done on floor, providing more relaxation and benefits. Do not do any Asana for more than 2 min (which is sufficient). Exercise schedule should not take much time so that it can be maintained regularly. Doing 600 Pushups one day will make you ill, whereas doing 20 Pushups every day will make you strong. Pranayama – Mainly Kapalbhati, Anulom Vilom and any other according to season that you like. Trataka – Looking at some point without blinking till you get water in eyes or get tired enough. (You can do this before sleeping at night also but do once in a day only). Eye Sight improves by this. Try to breathe slowly. Trataka is the process of looking at a fixed point (black point (1cm x 1cm on A4 paper) on white paper, Candle light, American Power Circle (see below), flame of small clay cup lamp or candle)) with fullest concentration till tears come to one’s eyes (or when you feel burning sensation in eyes (for people with tired or weak eyes look only till you feel tired and cannot do more). 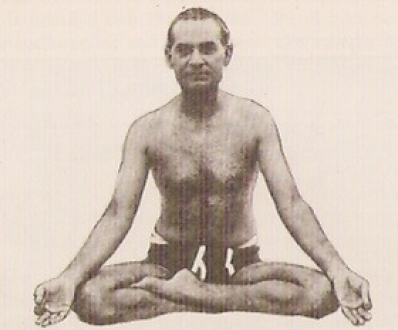 For doing Trataka sit in Sukhasana. Increase the duration of Trataka gradually. Meditation – Sit in Sukhasana (straight Back (straight Spine) is very important), first concentrate on breathe going in and out. Try to breathe slowly. Then after some time try to empty your mind by taking your mind away from everything including breathing. Then again focus on breathing, alternate this. This will achieve you both states of meditation – Focusing on one point and Keeping the mind empty. The key to meditation is leaving everything (consciousness) out of your mind for some time. Effectively said – become like a corpse in Shavasana, without any movement and thoughts. Polarization – Lie down on back in shavasana, close your eyes. visualize Golden Energy entering your body from head bringing positive emotions and energy, and Blue light going out of feet taking out negative emotions and impurities. Nyasa Dhyan – Lie down on back in shavasana, feel and think about your 26 vital centers in human body. Soles 2, Calves 2, thighs 2, Genital Organ 1, Navel 1, Heart 1, Lungs 2, Shoulders 2, Right palm, hand and shoulder 3, left palm, hand and shoulder 3, Eyes 2, Ears 2, Mouth 1, Nose 1, Eye brows 1. The point of doing Yoga and Meditation is to control mind and stress. Too much grief and stress produces harmful poisonous chemicals in body which harms cells and consequently overall health in large amount. Do not expect to be healthy till you calm your mind. Breathe pure air of morning, if possible walks for 5 min in morning air. Massage some Coconut or Almond oil on body (makes skin better, and makes you active). Massage face in morning before bathing with Olive oil (1-2 drops) or Coconut oil (1-2 drops) (add some water if you have normal or oily skin), then wash after 15-30 mins. Massage face in upward circular motions with light hands without applying pressure. Massage very gently on face, especially area under the eyes. This will relax your face, make your skin glow and prevent wrinkles. Then bath. Body Wash is better than soap (as it contains less harmful chemicals and cleans more thoroughly). Dove go Fresh range (mainly Cucumber and Green tea), Fiama Di Wilis Clear Springs (lemongrass and jojoba), Palmolive (seaweed) are good bodywashes. Then do worship, give some time to God. Eat Healthy, Nutritious and Natural food (avoid processed foods). Eat Fruits and vegetables mainly as they Fibre, Vitamins and Antioxidants all of which are very good for body and mind. Eat in clean room. Water is most important for health. Water improves skin, hair, prevents aging, keep body free of toxins thus making liver healthy. Drink water after 1 hour of eating foods, and keep drinking enough water throughout the day. If you drink water with food it will dilute you digestive juices in stomach and food will not digest properly. Drinking 8 glasses(add other fluid intake like milk also to this amount) of water daily is recommended. Eat food rich in Antioxidants(which minimizes Free radicals which cause cellular aging) like Ornage, Grapes, Garlic, Apple, Spinach, Tomato, Okara, Pomegranate. Nearly all fruits and vegetables are good in some way. Cooked food should be eaten when lukewarm. Do not store cooked food for eating later. Fruits and vegetables should be eaten as much fresh as possible. Use refrigerator as less as possible. Not only it will save you from old food, cough but also save electricity and your money. Green Spinach is very rich in minerals and vitamins so eat it once each day except in rainy season (due to not being clean). Also drink enough water as eating Spinach will increase oxalate intake which slightly increases the risk of kidney stones. Drink 500 ml of milk, each day. Milk contains almost all vitamins and minerals and most importantly Vitamin B12 which you will not get elsewhere if you are vegetarian (as B12 is found in animal products only, also vitamin B12 contained in milk is estimated to be the most bioavailable, with approximately 51% to 79% absorption). Prefer Ghee (1 teaspoonful per day is recommended, do not take more than 2 teaspoonful) over Butter. Ghee is good for the nerves and brain. It has a good ratio of omega 6: omega 3 fatty acids which is ideal for overall health. Its is a source of beta carotene and vitamins A, D, E, and K. Beta carotene and vitamin E are vital antioxidants. One teaspoonful has good amount of Vitamin A so it is good for eyes also. Ghee is an ideal fat for deep frying because its smoke point (where its molecules begin to break down) is 250 °C (482 °F), which is well above typical cooking temperatures of around 200 °C (392 °F) and above that of most vegetable oils. Never fry oils above smoke point as it increases carcinogens in food. Coconut oil is also very healthy for cooking but lacks the vitamins of Ghee. Stomach is like the mind of body in physical working. Take Electrolytes and drink enough water when you feel really weak as it is generally due to lack of water and many common diseases create shortage of water in body. Do your work or Go for work. Come Home, Give time for Entertainment to recharge your batteries, Give time for family, Study to develop your mind. Now you are completely physically and mentally tired. Now get full 8 hours sleep and wake up with energy next day. Do not sleep just after sleeping. Give a break of at least 1 hour and do light walk. Before 15 mins of going to sleep leave everything and just relax for some time freeing your mind. You must do Mediation also just before this. Try to deviate least from ideal routine. If your job interferes with your routine completely, work very hard and with intelligence to get a better job and improve your life or you will definitely pay the bigger price of your health. Cast aside laziness and do everything with enthusiasm. You will get best results. 80/20 rule – Apply the 80/20 rule in life. Do the most important 20% things which will mainly change your life for better in your 80% time and rest 20% things in 80% time (so you can fulfill your hobbies, but your main goal will be also completed in time without you being burnt out). Apart from this put sufficient time for Entertainment. Eat food that releases energy over a prolonged period of time like a banana. When you get hungry between meals, eat healthy snacks (instead of junk food) or foods that contain protein. Fruits are good. Pour cold water over each wrist. This gets your blood circulating. Work out then take rest. Exercise, Yoga, Pranayama and Meditation are must for mind also. Try not to take tension. Work hard to make your life better. Have good and happy nature. Keep negative thoughts, emotions and habits like greed, ego etc. out of your life. Have emotions flow outside of you like river, do not store them like pond water. Have sufficient entertainment. Do not forget to read funny literature. Enjoy life. The only medicine for Bhavrog (conditions of life) is DOING GOOD WORK (Good Karma), and worshiping God. As Karma makes the Luck that is to come in life. As you sow, so shall you reap.